The streets of Gaya, in Bihar, are buzzing with crowds just like they do every year during Pitrapaksha (or Pitru Paksha) Mela. During this grand annual fair, the ghats of Gaya are visited by millions of Hindus wishing to perform last rites (or Pin Daan) for their ancestors. But, just like the banks of River Falgu are auspicious for the Hindus, similarly the religious sites of Bodh Gaya are important for the Buddhists. So, there is a lot of history and mythology associated with the ancient city of Gaya and the Gaya tourist places. Let us take a Gaya sightseeing trip today. The city of Gaya finds a mention in Indian epics – Ramayana and Mahabharata. It was also the seat of power for the mighty Magadha Empire. Apart from this, Lord Buddha spent many years of his life in this ancient city. 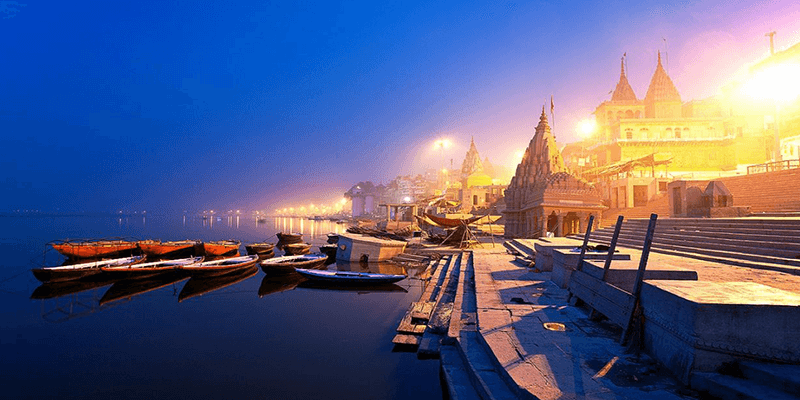 So, if you are in Bihar or attending the Pitrapaksha Mela 2018, then here are some Gaya tourist places you should have in your travel bucket-list, apart from of course Gaya Pind Daan. Situated on the banks of Falgu River, this Gaya temple has an important Hindu mythological tale associated with it. It is believed that Lord Vishnu killed Gayasur here by placing his left foot on Gayasur’s chest. The foot imprints of Lord Vishnu are still preserved on a block of basalt within this temple. However, the Buddhists also hold this temple auspicious, as they believe that the aforementioned footprint is one of Lord Buddha. 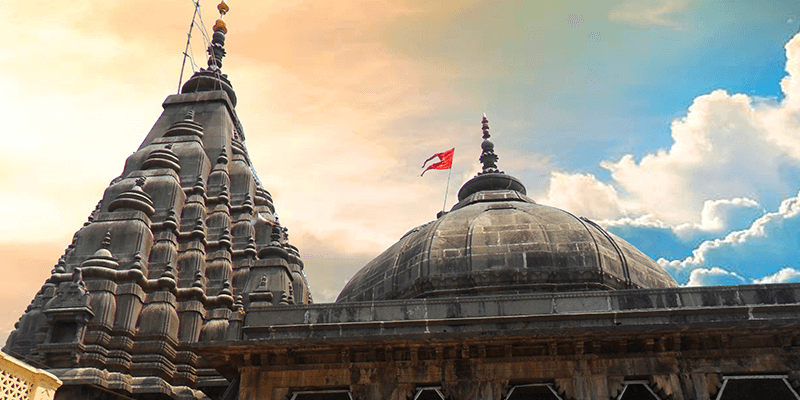 Thankfully, both the faiths have respected each other’s belief and Vishnupad Temple has become holy for both religions. Must see: The morning aarti, conducted at 5 AM, is a must attend. Trivia: The Pandas outside the temple can be seen carrying ledgers. These ledgers carry the history of your family. You can trace the roots of your family by paying these Pandas. 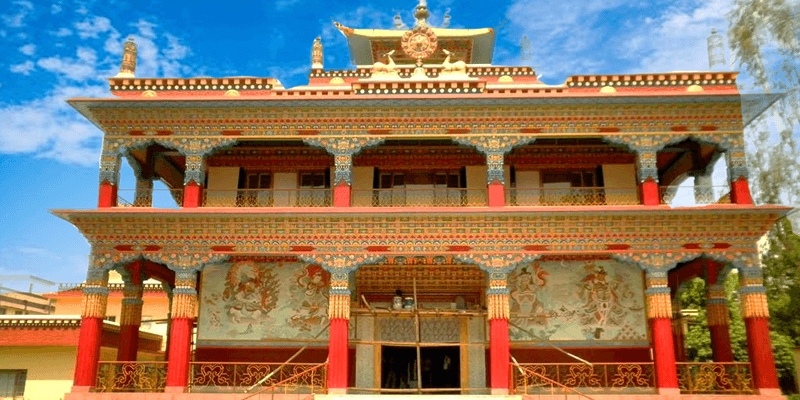 Tibetan monastery is one of the biggest attractions of Bodh Gaya tourism. It is the oldest and largest monastery in Bodh Gaya and contains a large number of ancient Buddhist scriptures and documents. There is an idol of Maitreya Buddha decorating the temple. Another attraction of the Tibetan Monastery in Bodh Gaya is the 10 meter high metal drum painted in golden and red. This object is known as Dharmachakra or the Wheel of Law. There is a vast library within the monastery that contains books on different aspects of Buddhism. Trivia: The meditation centre within the monastery conducts various courses on meditation and the principles of Buddhism. 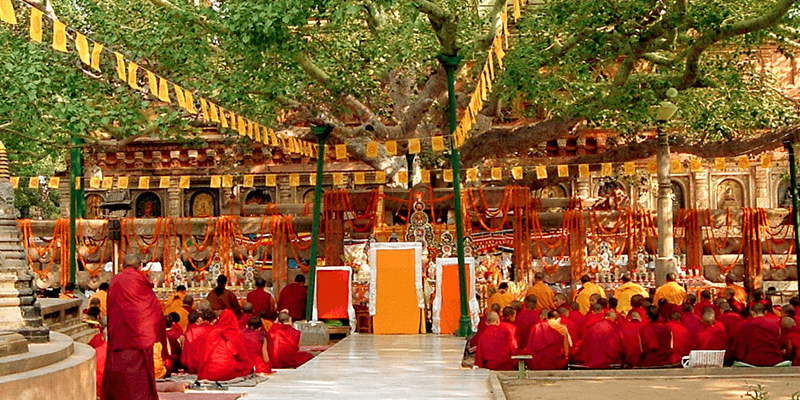 It is believed that under this huge banyan tree in Bodh Gaya, Lord Buddha attained ‘Nirvana’. It is mentioned in the holy Buddhist scriptures that Lord Buddha meditated under this tree for seven days before he got enlightenment. The Burmese merchants Tapassu and Bhallika also surrendered to Lord Buddha under this tree and became the first lady devotees of Buddhism. The tree can be found in front of the Mahabodhi Temple. Over the years, the tree has been visited by many eminent historical personalities, Asoka is the most mention worthy among them. There are many laws in place to preserve the sanctity of this site, and the tourists must adhere to them. Plucking leaves or picking its twigs are not permitted as this tree carries deep emotional and religious values. The tree is constantly guarded by two home guard personnel. Trivia: The estimated age of the tree is 2500 years. There is a senior Botanist appointed for taking care of the tree. Ratnaghara, which literally means ‘Jewel House’ is situated towards the north-western side of the Mahabodhi temple in Bodh Gaya. 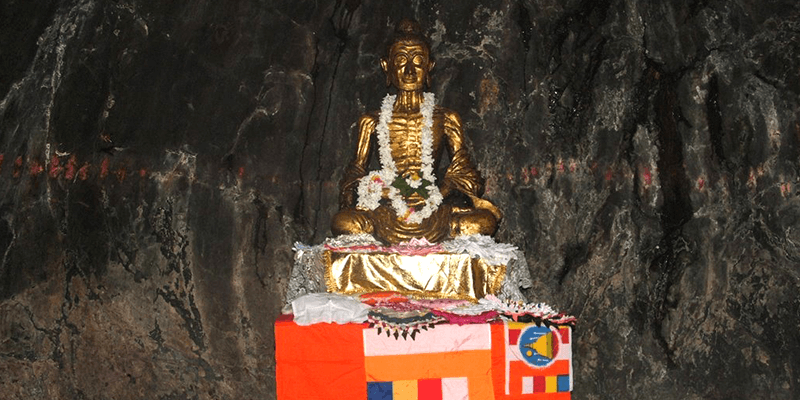 According to the legends, Lord Buddha spent his fourth week of meditation at this exact site. And during this week, it is believed that colors were emitted from his body. As a memory of this auspicious event, there are flags of many colors decorating Ratnaghara. 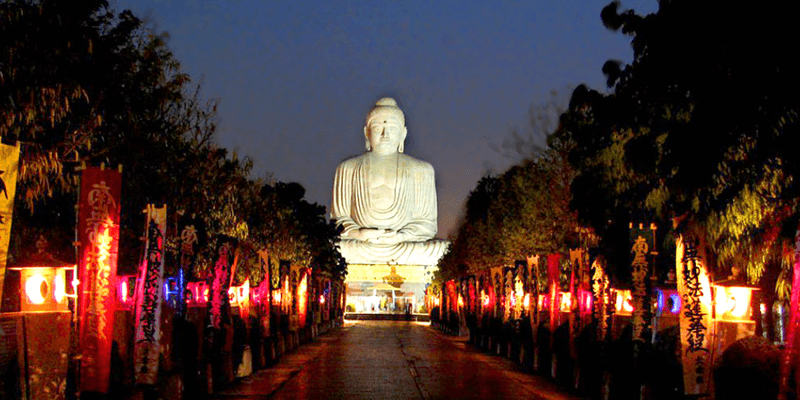 In the present times, Ratnaghara has become famous for its huge Buddha statue. There is a new park in the area that houses the tallest Budda statue in India. The greenery and tranquility of the place will surely win your hearts. Trivia: The Buddha statue at Ratnaghara is 880 ft in height and was consecrated by Dalai Lama. You haven’t been to Gaya if you haven’t done ‘Pind-daan’. Pind daan carries utmost importance in Hindu culture and it is done for the peace and well being of ancestors. During the month of ‘Shraadh’, Gaya is filled with people doing ‘Pind daan’. There are various ghats along the River Falgu where one can perform this ritual. However, if you do not wish to do ‘Pind Daan’, you can simply visit one of the many ghats to enjoy the sunset views along with the cool breeze. This is one the oldest cave temples of India. The temple is dedicated to Lord Buddha and situated over a place where he spent six years meditating. The temple is on top of a hill, so one has to trek all the way up to the temple. The trek takes approximately 20 minutes if you are a young and fit adult. If you want to skip the trek, there is also option to hire a ‘palki’. Charges for Palki hire: INR 300. 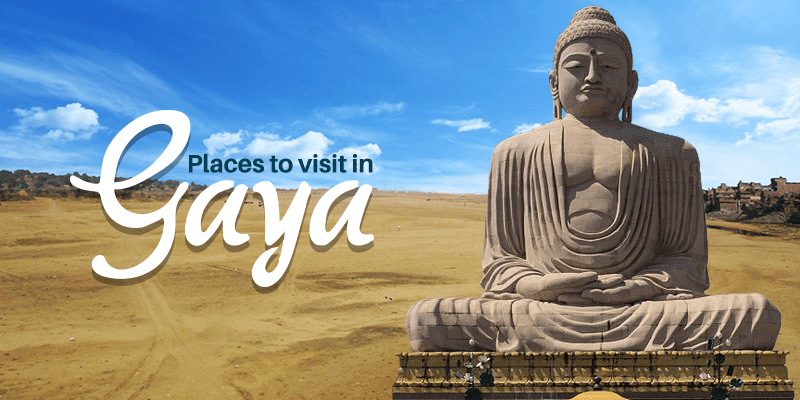 Gaya has plenty to keep you interested – from historical places to religious ones, there is a lot to do and see around in Gaya. बहुत ही अच्छी एवं रोचक जानकारी है ! wonderful pics full of spiritual.